Create and Share Professional-looking Gantt Charts Easily from free Gantt chart template, which allows users to create great-looking Gantt charts and project schedules in minutes. Gantt chart is an effective tool for project plan and operations schedule involving a minimum of dependencies and interrelationships among the activities. Gantt chart is a graphical representation that illustrates the start and finish dates of the terminal elements and summary elements of a project. 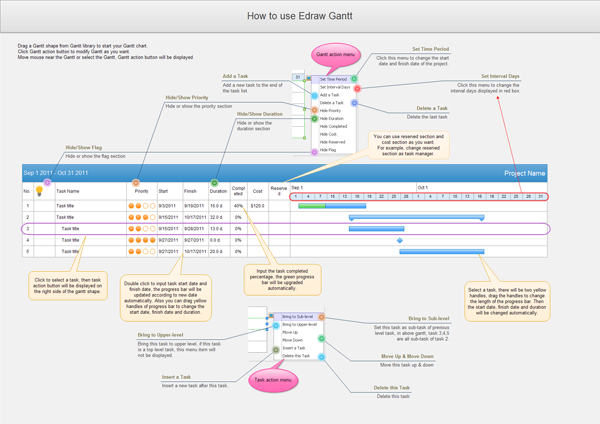 Edraw Gantt Chart Software is an easy to use project management and business diagramming program used by a variety of companies. The latest version of Edraw has added the Gantt chart templates, which allow the users to create great-looking Gantt charts and project schedules in minutes. 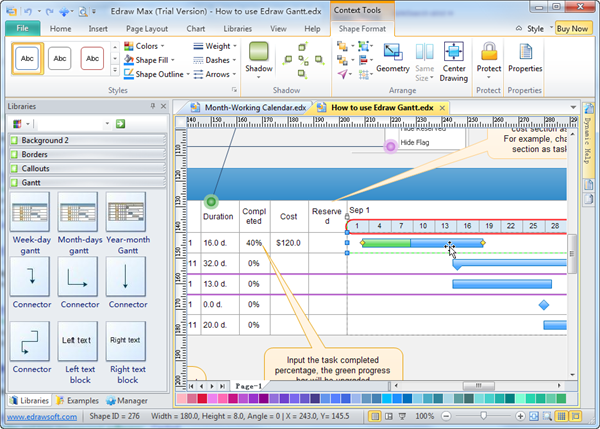 Discover why Edraw is the easiest Gantt chart software. With Edraw Gantt chart software there are no limits to your creativity for the design, distribution, or content of your drawings. Whether you want to get a thorough overview of your projects, plan your projects or be aware of the detailed task assignment, Edraw makes all these happen. It is easy to share the detailed project plans and track the project progress with our Gantt chart, Pert chart and timeline software. Gantt Charts Creation - automatic, characteristic, infographic. Our Gantt chart software includes some free Gantt chart templates available for week-day Gantt chart, month-day Gantt chart and year-month Gantt chart. You can start your Gantt char easily from the smart templates. Open Edraw program, then click the Gantt type in the Project Management library categories. You can read the tutorial to learn how to draw a Gantt chart from templates. An Gantt chart example is equivalent to a thousand words! A dynamic built-in example is priceless! The Gantt chart examples will help you create Gantt chart rapidly. What is more, it is easy to learn how to draw a professional Gantt chart. As you know, for daily project management, you need to draw Gantt charts, matrix diagram, flowcharts, UML diagrams, business charts or timeline. To buy a separate package for every diagram is not a clever choice. Edraw Max is a vector diagramming software for flowcharting, mind mapping and business charting. Now it provides some new features to support project management types of drawing diagrams. 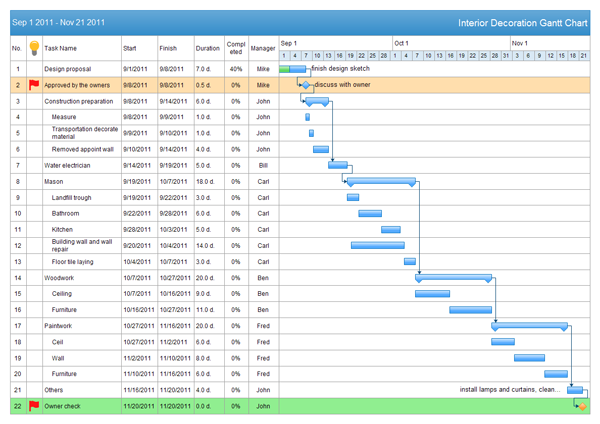 Gantt chart, as a new added drawing type, is full free and available for all customers. With our Gantt chart software, you can create Gantt charts, project schedule tables, presentation documents, project timeline and work report forms all in a software. You can build the relation and link data relation of different drawing types. It has affordable prices and more favorable upgrade policies. Our project gantt chart tool is most commonly used for tracking project schedules and managing time progress. you can add additional information about the various tasks or phases of the project. For example, how the tasks relate to each other, how far each task has progressed, what resources are being used for each task and so on. Easily customize your chart by using color style and other free clip art symbols. It is also easy to collaborate with other drawing types and share in some popular format such as PDF document, SVG format, HTML or MS Office documents. The Gantt chart tool is outstanding I've seen online. I was able to create a new gantt chart from the template without reading any help document. It's very easy to use. I've made a real impression on edraw templates such as callouts, timelines and calendars.